CONTEXT: Rapid diagnosis and detection of Rifampicin (RIF) resistance are essential for effective disease management of tuberculosis (TB). Cartridge-based nucleic acid amplification test also known as GeneXpert Mycobacterium tuberculosis (MTB)/RIF assay is a novel integrated diagnostic system for the diagnosis of TB and rapid detection of RIF resistance in clinical specimens. AIM: In the present study, we determine the performance of the MTB/RIF assay for the rapid diagnosis of TB and detection of RIF resistance in pulmonary specimens obtained from presumptive multidrug-resistant (MDR) TB cases. SUBJECTS AND METHODS: This is a cross-sectional observational study conducted in culture and drug-susceptibility testing laboratory between January 2014 and December 2014. A total of 1994 sputum samples were obtained from presumptive MDR-TB cases of Dharwad and Belgaum districts of Karnataka. All samples were tested on GeneXpert for MTB/RIF detection. RESULTS: A total of 1994 presumptive pulmonary TB clinical samples were received of which 840 (42.1%) were MTB complex (MTBC) positive and 1154 (57.9%) were negative. The MTB/RIF assay also detected 127 (6.4%) RIF-resistant specimen and 713 (35.6%) RIF-susceptible specimens. CONCLUSIONS: The MTB/RIF test is a simple and rapid method, and staff with adequate training can perform this test with minimal laboratory setup. It helps to avoid the injudicious use of the anti-TB drug and offers high potential for the diagnosis of TB and RIF resistance due to its capacity for direct detection of MTBC, its rapidity and its simplicity. Tuberculosis (TB) remains a major cause of morbidity and mortality, with over nine million new cases and about 1.8 million deaths taking place annually. In most countries, smear microscopy persists to be the primary system for diagnosing TB. While economical and comparatively easy to perform, smear microscopy method has an only modest sensitivity (35%–80%) and cannot differentiate between drug-sensitive and drug-resistant Mycobacterium tuberculosis (MTB). In the past decade, significant research has been made towards the expansion of new diagnostics for TB. The WHO-endorsed diagnostic tools comprise molecular line probe assays for the multidrug-resistant (MDR) TB diagnosis (GenoType® MTBDRplus [Hain Lifescience, Nehren, Germany] and INNO-LiPA Rif. TB [Innogenetics, Gent, Belgium]) and a rapid detection and speciation assay (Capilia TB-Neo). Light-emitting diode fluorescence microscopy as a substitute for conventional microscopy was recommended by the strategic and technical advisory group for TB in 2009 to the WHO. In 2010, the WHO implemented GeneXpert MTB Rifampicin (RIF) assay (Cepheid, CA, USA) to assist the rapid detection of MTBisolates as well as to detect the resistance against RIF with a revelation of >95% sensitivity for smear-positive cases and 55% for smear-negative cases. It can be directly performed on sputum samples of individuals with presumptive TB and can deliver results within two hours. The aim of this study is to determine the diagnostic utility of the GeneXpert MTB/RIF assay for the diagnosis of TB and rapid detection of RIF resistance in presumptive pulmonary TB clinical specimens of Dharwad and Belgaum Districts of Karnataka. This study was carried out over a period of one year (January 2014–December 2014) in culture and drug-susceptibility testing (DST) laboratory. A total of 1994 cases of presumptive MDR pulmonary TB (Category I and Category II TB cases) from Dharwad and Belgaum districts of Karnataka were included in this study. Sputum sample was collected in Falcon tube and sent without delay in the cold chain for Xpert MTB/RIF assay. Sample reagent was added directly into the falcon tube containing sample in the ratio 2:1. After placing the cap, the tube was vortexed 10–20 times and incubated at room temperature. After 10 min of incubation, the specimen was vortexed again for 10–20 times and kept aside for five min. Cartridge cap was opened after labelling with sample ID. Two millilitre of the processed specimen was transferred with the sterile disposable transfer pipette from the collection container to the cartridge, and the cartridge lid was closed. Create test was opted in the software, and the cartridge barcode was scanned. After entering the sample ID, the cartridge was positioned on the Xpert machine (module) and test was started. Results were recorded within 2 h.
The report of the test is retrieved after 2 h of test. The two components in the report were noted. The first is the detection of MTBcomplex (MTBC), and if positive, the second component is the identification of RIF resistance. This study included 1994 sputum specimens from Dharwad and Belgaum district, all of which were received and processed at culture and DST laboratory between January 2014 and December 2014. Among 1994 patients, 1257 (63.1%) were male and 737 (36.9%) were female with a male: female ratio of 1.7:1. All the samples were tested on the GeneXpert® MTB/RIF assay by the routine diagnostic standard. Of the 1994 sputum samples of the patients tested for TB, 840 (42.1%) were positive and 1154 (57.9%) were negative for MTBC. 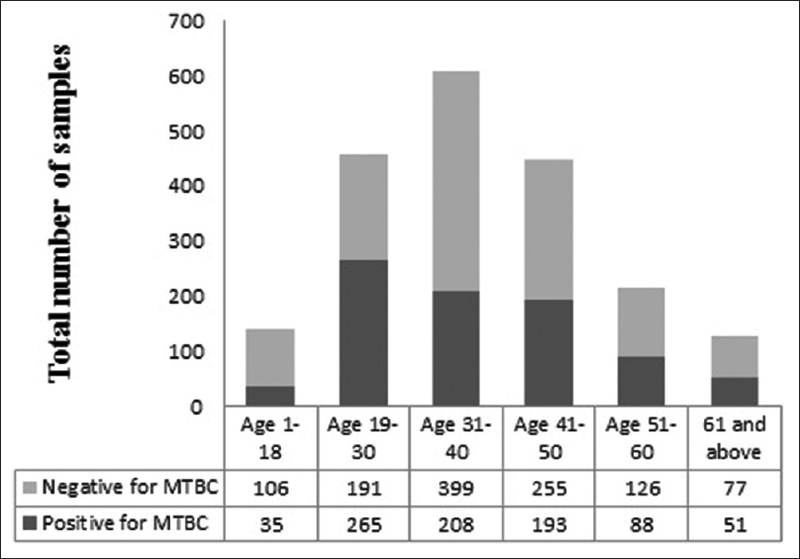 The detection of MTBC is presented in [Figure 1] which is distributed age wise. Of 840 MTB positive detected by GeneXpert, 713 (84.9%) showed were sensitive to RIF and 127 (15.1%) were resistant to RIF. 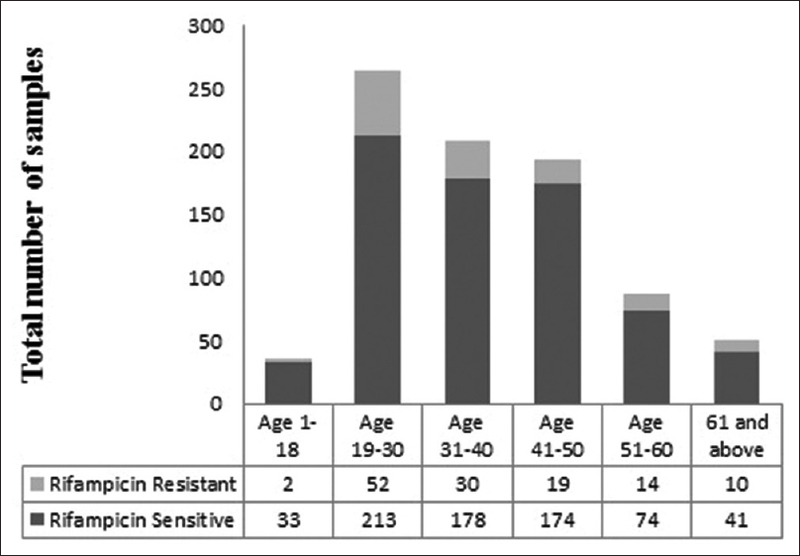 Age-wise distribution of RIF resistance among MTBC-positive cases is shown in [Figure 2]. The detail of the GeneXpert result is shown in [Table 1]. The reason for the high rate of positivity could be selection bias of the patients, as two linked districts were in criteria A and one district in criteria B for the MDR testing. No new cases, such as presumptive HIV, extrapulmonary (EP) TB and contacts of known MDR patients, were included in the study. Conventional laboratory techniques such as direct microscopy for the diagnosis of TB are far from being sensitive. Furthermore, cultures are time-consuming, necessitate biosafety procedures and require trained laboratory staff. Molecular techniques have significantly changed the field of TB diagnosis and have been proven to yield rapid results while being highly sensitive. Several polymerase chain reaction (PCR) assays employing some MTBgene targets have recently been defined. The new GeneXpert assay tested in our study targets the RIF resistance-associated rpoB gene region by heminested PCR with three specific primers and combines the sensitive detection of MTBDNA and determination of RIF resistance. Furthermore, the turnaround time is short due to automation of bacterial lysis, DNA extraction, real-time PCR amplification and amplicon detection in a single system. There are few limitations to the current cartridge-based nucleic acid amplification test device such as the inability to detect resistance to isoniazid and other drugs, uninterrupted power supply and ambient temperature not exceeding 30°C. Compared with smear microscopy, GeneXpert substantially increases TB detection among presumptive TB cases. For RIF resistance detection, GeneXpert provides accurate results and can allow rapid initiation of treatment in paediatric as well as MDR-TB contacts. Studies have found that MTB/RIF assay has a calculated limit of detection of 131 colony-forming units (CFU)/ml of sputum and also able to detect as few as 10 CFU/ml of sputum in 35% of samples compared with approximately 10,000 CFU/ml with conventional smear microscopy. Hence, this assay is very much useful in EP-TB and HIV TB cases where the bacillary load is likely to be less. A recent study showed the high sensitivity of over 97% and specificity of the Xpert assay for pulmonary specimens. Overall, our findings suggest that decentralised MTB/RIF test implementation is feasible and could lead to an improvement in TB care and control. Increased detection of TB and MDR-TB will facilitate to scale-up first-line and more importantly second-line treatment. The study first of its kind from North Karnataka a geographical region with high prevalence of TB has shown GeneXpert MTB/RIF assay worthy tool in detecting TB cases and also RIF resistance with swift turn over time (around two hours) when compared to the other conventional methods. Laboratory technologist with adequate training can perform this test with basic laboratory setup. It also helps to initiate the appropriate use of anti-TB drugs. We would like to thank and acknowledge the support provided by the Central TB Division, Delhi, and State TB Training and Demonstration Centre, Bangalore, towards laboratory setup and supply of kits and consumables for GeneXpert assay. This study was financially supported by the Centrial TB Division and STDC, Karnataka. World Health Organization. Global Tuberculosis Report 2014. WHO/HTM/TB/2014.08. Geneva, Switzerland: World Health Organization. Available from: http://www.who.int/tb/publications/global_report/gtbr14_main_text.pdf. [Last accessed on 2015 Sep 10]. Mathew P, Kuo YH, Vazirani B, Eng RH, Weinstein MP. Are three sputum acid-fast bacillus smears necessary for discontinuing tuberculosis isolation? J Clin Microbiol 2002;40:3482-4. Pai M, Minion J, Sohn H, Zwerling A, Perkins MD. Novel and improved technologies for tuberculosis diagnosis: Progress and challenges. Clin Chest Med 2009;30:701-16, viii. Van Rie A, Mellet K, John MA, Scott L, Page-Shipp L, Dansey H, et al. False-positive rifampicin resistance on xpert® MTB/RIF: Case report and clinical implications. Int J Tuberc Lung Dis 2012;16:206-8. Greco S, Rulli M, Girardi E, Piersimoni C, Saltini C. Diagnostic accuracy of in-house PCR for pulmonary tuberculosis in smear-positive patients: Meta-analysis and meta regression. J Clin Microbiol 2009;47:569-76. Joydeep G, Souvik R, Saumen N, Subhadip H, Soumya K, Abhijit M. A study to evaluate pattern of rifampicin resistance in cases of sputum positive pulmonary tuberculosis. J Evol Med Dent Sci 2015;28:4762-8. Sowjanya DS, Ganeswar B, Ramana Reddy VV, Praveen JV. CBNAAT: A novel diagnostic tool for rapid and specific detection of Mycobacterium tuberculosis in pulmonary samples. Int J Health Res Mod Integr Med Sci 2014;4:28-31. Sowjanya DS, Ganeswar B, Ramana Reddy VV, Praveen JV. CBNAAT: A novel diagnostic tool for rapid and specific detection of mycobacterium tuberculosis in pulmonary samples. Int J Health Res Mod Integrated Med Sci 2014;4:28-31. Malhotra B, Pathak S, Vyas L, Katoch VM, Srivastava K, Chauhan DS, et al. Drug susceptibility profiles of Mycobacterium tuberculosis isolates at Jaipur. Indian J Med Microbiol 2002;20:76-8. Trivedi SS, Desai SG. Primary antituberculosis drug resistance and acquired rifampicin resistance in Gujarat, India. Tubercle 1988;69:37-42. Chowgule RV, Deodhar L. Pattern of secondary acquired drug resistance to antituberculosis drug in Mumbai, India–1991-1995. Indian J Chest Dis Allied Sci 1998;40:23-31. Bodmer T, Ströhle A. Diagnosing pulmonary tuberculosis with the xpert MTB/RIF test. J Vis Exp 2012;9:e3547. Steingart KR, Schiller I, Horne DJ, Pai M, Boehme CC, Dendukuri N, et al. Xpert® MTB/RIF assay for pulmonary tuberculosis and rifampicin resistance in adults. Cochrane Database Syst Rev 2014;21:CD009593. Stop TB Department WHO. Roadmap for Rolling out Xpert MTB/RIF for Rapid Diagnosis of Tuberculosis and MDR-Tuberculosis. Available from: http://www.who.int/tb/laboratory/roadmap_xpert_mtb-rif.pdf. [Last accessed on 2015 Jul 28].